Tried to do the right thing, to push the boundaries of science, to propel the Human race to new heights. But we Pushed too far, and something noticed. Something ancient. Something that knew us better than we knew ourselves. So here we drift, floating on Hope. Only eleven Humans survived the consequences of our hubris. I’ve finally managed to get the art to a point I’m happy with. It’ll get tweaked a ton more, I’m sure, but for now I’ve just got to stop fiddling otherwise I’ll go blind. So here it is! The new and improved all-original artwork for Static Push. I hope you like! So I’ve been putting this off for a while now. Exposing a fledgeling hobby to the wilds of the internet and claiming it’s a talent is akin to emptying a bag of flour out of an open window and claiming it’s a cake. But delaying any longer would be like baking that cake without turning the oven on. We’d all be eating gooey uncooked website mixture, which might be tasty, but will eventually give us all indigestion. That metaphor got away from me a bit. Let’s segway smoothly into the reason for this cake; I write stuff. And recently I wrote a long bit of stuff about the same thing. This, in some circles, could be called a “book”, although in the circles I move in it’s most often referred to as “get that out of my face” or “did your infant daughter write this?”. The moral of that story is: I don’t have very nice friends. It’s a book! And it’s actually completed, mostly. Feedback from the first three chapters has been extremely promising, and so I’ve been forced to “put myself out there”. And not in the creepy way that results in restraining orders or anything. Not this time. 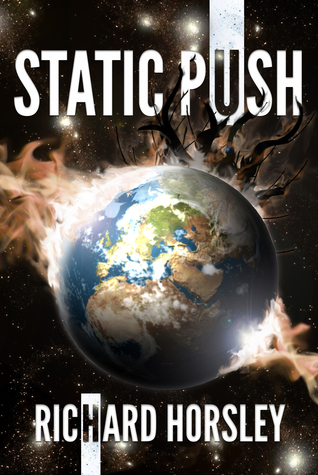 Static Push is my first novel, exploring the confines of Earth, as well as the loneliness of space and follows the journey of a small group of distinct individuals as they try to survive both. Written primarily in NaNoWriMo 2014, Static Push is now in editing, but you can get your hands on the first three chapters right here in several formats for your eyeball pleasure. Please leave comments to let me know what you think, all feedback is good feedback!